SUNDAY 13TH AUGUST 2006 (SILVERSTONE, UK): Wet tarmac, 650 horsepower and no traction control. Today’s GP Masters race was always going to be a belter, and it delivered in spades. The lead changed seven times during the 26 lap race, with pole sitter Christian Danner surrendering his position to Stefan Johansson at the start. The lead was then seized by Eddie Cheever. Cheever and Eric Van de Poele had an exceptional battle for supremacy, but the conditions would get the better of Eric, and he dropped back after a couple of thrilling 360s. Cheever’s racecraft was faultless throughout, giving the 48 year-old American his first GP Masters victory. 1st Eddie Cheever (USA): "I kept looking in my mirrors thinking ‘I know Nigel’s going to be up here any minute’, but then I saw him sat in the garage on one of the big TV screens and thought ‘Okay, I have a crack at this today’! It was very slippery and very busy at the start. I was lucky that Warwick and Danner both spun out in front of me, and then had a really exhilarating race with Eric Van de Poele where we swapped the lead several times. It’s a testament to the commitment of the British fans that they showed up in the rain. I have always loved driving at Silverstone, ever since I first came here as a 17 year-old, and hope to be back soon." 2nd Eric Van de Poele (Belgium): "For me it was incredible. I couldn’t see anything! I actually spun twice out there, so this is a good position to finish in. For a long time, even when I was in the lead, I didn’t know what position I was in because I was concentrating so hard on keeping the car pointing forwards. I was afraid to look at the pit board or press the radio button." 3rd Christian Danner (Germany): "I was running second up until the end of the first lap when I was hit up the bum by Mr Warwick. We both spun and had to wait for most of the field to go by before we could rejoin, putting me right down the order. I had to overtake a lot of cars and had a wonderful battle with Hans for third. It’s easy to overtake in these cars. There are no pitstops, no traction control, no tactics – it’s just your right foot that matters and that’s why this series is so good." 4th Hans-Joachim Stuck (Austria): "For me, fourth place is like a win considering the problems we’ve had this weekend and the fact that I’ve had so little running. Thank you to GP Masters for getting all the cars to the grid. A lot of people forget that there is only one team here. An F1 team only has to field two cars, these guys look after 16. And that’s 16 totally crazy drivers to organise. We’re having so much fun. The camaraderie between us is just so fantastic and it’s exactly how motor racing should be. I want more!" 5th Alex Caffi (Italy): "Having not done the qualifying session yesterday or spent much time in the car, this was an unexpected result. I had some good fights out there. It was a good show, and the best race so far." 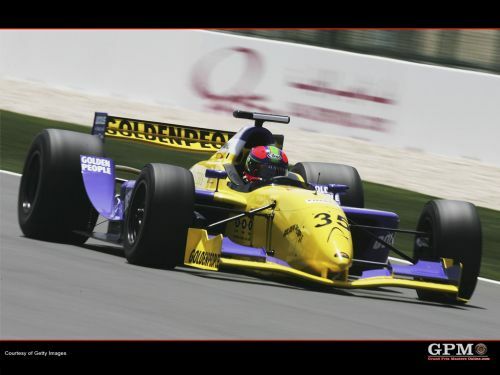 6th Riccardo Patrese (Italy): "If two years ago anyone had said to me that I’d be racing a single-seater at Silverstone in 2006 I would have told them they were crazy! The race was fantastic, and I was very happy to bring the car home without any spins. I think overall we gave the public some great entertainment this afternoon." RET Nigel Mansell O.B.E (Britain): "First of all, congratulations to Eddie – he did a superb job. I think there should be a special prize for how many spins you can have in one lap. I spun three times going to the grid! Unfortunately the differential had exploded and I lost drive at the rear. That’s just the reality of motor racing – it’s not an easy sport to do. Occasionally these failures happen, and today it happened to me. I went out again in the middle of the race for one more lap, which I hope the fans enjoyed – I certainly didn’t! I spun three times again, but I made it back to the pits and I think that deserves a round of applause!" Scott Poulter (CEO, GP Masters): "I’d like to thank all the mechanics and engineers for making it all happen today and getting all the drivers out there. Thank you also to Dr Raghbir Sian and his team who really turned it on at the last minute. The boys on the shop floor made a Herculean effort on the engine front. The race was pretty unpredictable the whole way through, very challenging and brilliant entertainment. The next GP Masters race will be in South Africa in November, and we’ve been made an offer to race in Qatar next year which we’re hoping to finalise in the coming weeks.